We are resuming our reflections! Happy Easter Season! Our Lenten journey was blessed with the examples of the Benedictine Women. They inspire us with their faith, focus, relationship with God, and their ability to express and communicate to us from their respective times in history. It is Easter Season now. That blessed time during which the liturgy takes us through the Acts of the Apostles and the story of the early Church. The Gospels speak about the reactions of the apostles to the resurrection and meeting Christ on the road or at the sea shore. The Gospel of John is being read this week, the second week of Easter. We are embarking on this Easter road that is paved with the joy of the resurrection. It is also reverberating with the expectation of the Spirit to come. Pentecost is becoming visible on the horizon. 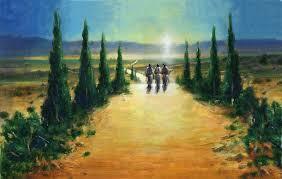 The picture shows the disciples on their way with to Emmaus and accompanied by Christ. What would it be like to journey through this sacred Easter Season like these disciples? No matter what their grief, their doubt or denial was, Christ walked with them. Make it your Easter practice to walk with Christ daily. Speak to him, share with him. Make your relationship with him central like the Benedictine Women did. May this road and journey with Christ lead you to Pentecost! 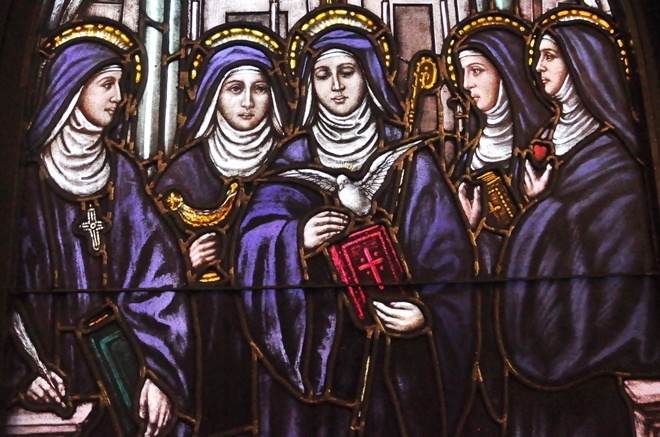 Here you see our window of the five Benedictine Women again. They have been accompanying us on our Lenten Journey. We have reflected on St. Hildegard and her legacy. She is the first one to the left in the window. The second on is St. Walburga. Note that she is holding an oil lamp in her hand. St. Walburga was born in 710 A.D, the daughter of Richard, an under-king of the West Saxons of Britain. She went to school at Wimborne Monastery, Dorset, England, and later became a nun there. At the request of her uncle, Saint Boniface, the “Apostle of Germany”’ the Wimborne Monastery sent St. Walburga and other nuns to form monasteries in Germany. She spent four years in the monastery of Bischofsheim and later became abbess of the monastery of Heidenheim. The sisters dedicated themselves to praying the Divine Office, the prayer of the Church. Additionally, children were educated in the spirit of Saint Benedict and the poor and sick were helped and comforted. St. Walburga was a leader during the early Christian years of the Germanic tribes. She is the patron saint of the diocese of Plymouth, England. The feast of St. Walburga is celebrated on the date of her death, February 25th. Her remains were transferred to St. Walburg Monastery in Eichstätt, to which the Benedictine Sisters of Virginia trace their roots. Beginning in 893A.D. a liquid to which many cures are attributed began to flow from St. Walburga’s tomb yearly between October 12th and February 25th. This liquid became known as "Walburga's Oil", and was seen as a sign of her continuing intercession. The oil has always been collected and given to pilgrims. Healings attributed to St. Walburga's intercession continue to be reported up to the present day. 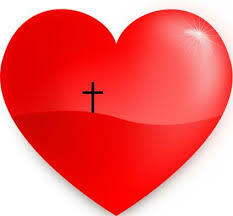 "To do your will is my delight; my God, your law is in my heart." 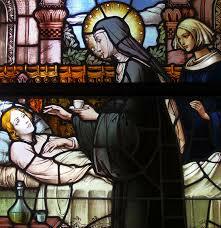 This stained glass window (which is not in our monastery) shows her as healer. Several stories passed on to us depict her as a healer, especially of children. This week reflect on what it means to be a healing presence to others. Have you ever experienced something like that? Maybe you just felt better after spending some time with a friend? Maybe somebody's calm presence helped you to cope with anxiety? Or what other examples come to mind? We have to allow a Benedictine Man to speak to us today. Just call it a break from our Lenten Reflections on Benedictine women. Today is the feast of St. Benedict. How could I not write about him??? What we can say about St. Benedict is that he lived with integrity what he perceived as the essence of Christian life. He wrote in chapter 72 of his Rule, "Let them prefer nothing whatever to Christ." As we continue to do Lectio Divina this Lent, pause for a long moment to let these words sink in, "preferring nothing whatever to Christ." This Lent, try this admonition on! What would it be like to prefer nothing whatever to Christ? What would it be like to be so sure what place Christ has in your life? How would your life need to change to live this out? What adjustments would you need to make? 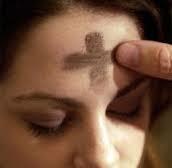 If you are considering religious life, could you imagine to give Christ such a prominent space in your life? We are beginning or Lenten reflections; our journey with five amazing Benedictine Women. 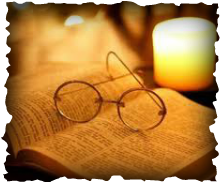 On this blog, we have been introduced to Lectio Divina and some of the Wisdom of the Rule of Benedict. This Lent, we will explore the witness of five Benedictine role models. How did the Benedictine way of life, Lectio Divina and the Rule of Benedict transform their lives? This is our chapel window of the five Benedictine Women saints at St. Benedict Monastery in Bristow, VA. As we pray in the chapel daily, the window and the saints continue speaking to us. You can find St. Hildegard (1098 – 17 September 1179) on the left. She is wearing a big cross that signifies her as an abbess. In her right hand, she is holding a quill and in her left, a book. She was a writer, poet, composer, scientist, herbalist and had other tremendous gifts. Her spirit shimmers through her writings and continues to inspire many. How can Hildegard contribute to our Lenten journey? Listening, as you know, is an important Benedictine practice. Benedict wants us to listen with the ear of the heart, indicating that the listening needs to come from a very deep and gently space within us. Picture Hildegard as the listener. the woman practiced in Lectio, receptive to God's word. In this image, the listener is not just focusing all of her attention to listening. Her eyes are aimed at something she is seeing, her hand is opened in a gesture of receptivity. She is listening with all her being. Lent is inviting us to listen deeply. Our prayer life and our spiritual practices are enriched and informed by Scripture readings, liturgy, and some of the reflections we might be reading over these holy 40 days. This time of repentance is not just aimed at prayer, sacrifices and alms giving. It is nudging us to conversion, to become the best person we can be. but free me from my sins. for I repent with all my heart. Hildegard speaks of repentance "with all my heart." Benedict speaks of listening with the "ear of your heart." Maybe repentance means that God's word leads me to follow through on what I have heard and understood. God's word prompts changes. 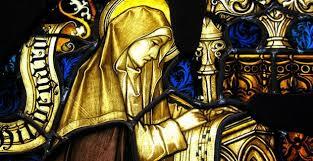 How is Hildegard addressing God? How does she see human beings in relationship to God? How does she see God in relationship with human beings? Does this give you an indication of how she relates with God in prayer? If you were to write a prayer expressing your relationship with God, what would you say? What is conversion all about for you? What issues or areas in your life need conversion? Invite God into this sacred journey of repentance and conversion. In our cycle of reading through the Rule of Benedict, we just finished the so called "Liturgical Code," several chapters (8-20) on how to pray the Liturgy of the Hours in community. Chapter 20 speaks of "Reverence in Prayer". Benedict says, "We must know that God regards our purity of heart and tears of compunction, not our many words,"
Let's stay with this for a little while! What do you associate with a "pure heart?" Benedict was intent on finding out if a candidate was really seeking God (RB 58.7). The seeking God part speaks of deep desire to me. In RB 49.7, he speaks of looking forward to Easter with “spiritual longing”. Seeking, desiring, longing are all verbs and notions that I connect with prayer and purity of heart. I am reminded of a childhood memory: One of the windows in our play room at home looked out on our parish church, which was about 3 blocks away. I could sit at that window and look out at the church steeple. I remember that I always wanted to see the church. I felt a great desire stirring inside of me and a connection to God was created. As a child, I had no idea that I was engaging in prayer with an undivided heart, that I was filled with spiritual longing. In chapter 19, Benedict reminds us, "We believe that the divine presence is everywhere..." My childhood experience prepared me for the Benedictine stance of experiencing God's presence. What were your experiences of God's presence like? Does your own Lectio Divina allow for God making God's presence known to you? After each sentence, pause, re-read it and ask God to let images rise up inside of you. There is an endless supply of images inside of each of us. We store images of what we have seen and what we imagined. There are numerous images presented to us on TV every single day. Images speak to us, stir something within us. They cause different emotions and reactions. Whatever images the following Gospel verses evoke for you, know that God speaks to you through images as well. If they are stirred up through Scriptures, they have their own stories to tell. Maybe they want you to make connections, heal painful memories and images of the past, or underscore some important new movements of the Spirit inside of you. Take note of all your images. Record them in your journal. Prayerfully reflect on each one. Write, pray, invite God to speak to you now. Here is an image that arose for an artist about the healing of the blind man. Stay with this picture. Does it express anything of what your own images did? If you like to journal about your prayer, draw your own images or find pictures that express your own. Paste them into your journal.